Sion is currently on secondment to Sport England. Please contact Shay Fenlon for workforce queries. Sion joined the team in May 2015 to develop, co-ordinate and deliver our workforce development plan. The aim of this plan is to establish an outstanding workforce of coaches, leaders and volunteers in line with the priorities of National Governing Bodies of sport. From increasing the number of active volunteers to improving the standard of coaching across the Bucks and MK, Sion is on hand to support all workforce initiatives. Sion moved back to Buckinghamshire from Somerset where he studied a Masters in Education (Sports Coaching) at the University of Bath prior to working for the Somerset Football Association as a Football Development Officer and as an Assistant Leisure Centre Manager at a Secondary School. 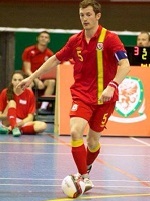 Although Sion enjoys playing and watching all sports, more often than not you can find him playing Futsal in the National League or representing Wales as the Captain of the senior Team.